We are proud to announce that Windwards Homeowners Assocation has selected Tinnelly Law Group as their association legal counsel. This beautiful condominium community has 187 units. It’s location close to Aliso Viejo Town Center provides residents with a taste of urban life, while it’s proximity to Aliso and Wood Canyon Wilderness Park encourages hiking and mountain biking. When not our exploring the local area, residents can relax in the community pool or spa. 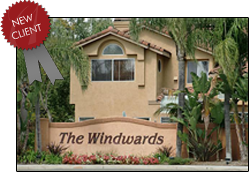 Our HOA Lawyers and staff look forward to working with Windwards.